Time: 5:00 pm Entry: Free! Scenario: • 600 Points • 4 Actions • Golden Age • House Rule: Highlander Rule Enforced Play a new scenario each week. Each scenario is crafted by our resident HeroClix gurus. 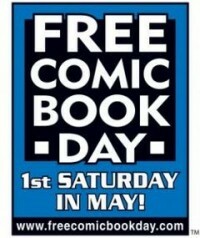 All day long we are celebrating comic books and giving away books made especially for this year's FCBD! Come in and join the fun! Learn to Play Magic! Free Event! Time: 5:00 pm Entry: Free! Scenario: This scenario is still being crafted. Please check back again soon for details! Play a new scenario each week. Each scenario is crafted by our resident HeroClix gurus. In recognition of Memorial Day we will close early today, at 6pm. Have a safe and happy holiday. Friday Night Magic: French Commander Format is a casual tournament which awards Planeswalker points for participation. The current banlist for French Commander can be found here. Prizes for this event include (but are not limited to) FNM Foil Prize cards and Store Tournament Credit. In recognition of Independence Day we will close early today, at 6pm. Have a safe and happy holiday.